The flight across the Pacific was calm, except for one frightening period of turbulence. I had never been in an airplane before this honeymoon. Not now, dear God, I prayed. There’s too much to do, a whole new life before us. Four days ago we flew from New York to San Francisco, and here we were again, flying above the clouds. I looked down at his hand as it caressed my shoulder. Then I backed away gently and picked up a magazine. Several times during the past few months I had thought of giving back the engagement ring and calling off the wedding. But I didn’t. My parents felt we were too young, but I convinced myself that God wanted this marriage to happen. Billy and I had our disagreements before, and we were having them now, but I believed that everything would work out; that we were meant to be together. The jarring motions of the plane made me nauseous, but Billy just patted my hand, telling me we’d make it to Hawaii just fine. “I’m not a fraidy cat like you, babe.” In his blue sports jacket and white turtleneck shirt, he looked very handsome. His brown eyes sparkled and his smile was wide and sincere. A man walked up the aisle past us just then. He looked so much like Billy’s father. “I wish Pop could have been at the wedding,” I whispered. “No.” I didn’t. But I believed that if Pop hadn’t committed suicide last spring, and if Billy’s mom hadn’t died of cancer the year before that, none of this would be happening. I was eighteen; Billy was nineteen. “After what you kids have been through, you deserve to have a good time.” Billy’s Uncle Wes had given us the idea for the trip. “You have the money,” Uncle Wes told us. “Live it up.” Because of Billy’s inheritance, we had the brand new Ford convertible, the expensive furniture in our newlyweds’ apartment, and a honeymoon trip most people our age could only dream about. His family was dead, so now we should live it up. Uncle Wes surely didn’t realize the irony in that remark. 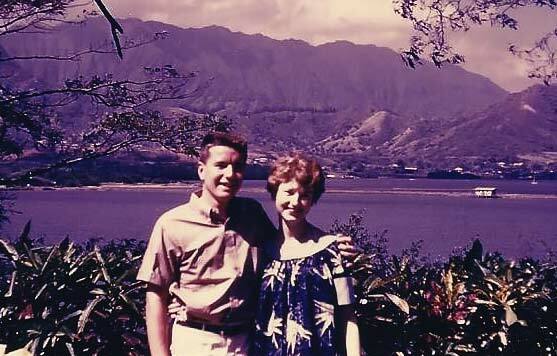 Hawaii had just become the fiftieth state, and ever since we started making our plans, I had been looking forward more to the honeymoon than to the wedding. I’d be a grown up woman, cut loose from my tiny room in my family’s chaotic household, seeing the world beyond Glendale, Queens; on my own at last. “You’ve got some imagination.” He turned to face me. “Yeah, it’s possible. It’s a nice thought, actually.” He kissed my forehead, and settled back in his seat. We landed at Honolulu Airport at midnight. Like in a movie, hula dancers greeted us as we left the plane and draped leis made of tropical blossoms — orchids and frangipani and hibiscus — around our necks. After claiming our luggage, we boarded the courtesy bus that would take us to the Moana Hotel on the beach at Waikiki, where we had reserved an oceanfront room. Palm trees, which I’d never seen before, lined the avenues, and the fragrance of the leis around our necks filled the bus and made me giddy. “Hope you’re not too tired,” Billy said, winking at me. “I’ve got plans for you, babe.” I attempted a smile but did not reply. I looked away from him, out the window at the whitewashed promenades and tropical resorts along the route to our hotel. Click Here to Return to the Book Page.